Different than the first two rocky movies, this one is more exciting and intense, and really shows where the series can go. Rocky III is another great movie. This one is very different than the other films that came before it, and that’s intentionally done to keep the series feeling fresh. For the first time, Rocky is living in a big house and is a major celebrity, who the city of philadelphia appreciates. He’s got a new opponent here (as opposed to the last two movies which featured the same opponent), and there’s also a totally new tone. the music is loud and fast and it goes right along with a movie that features more fights than any of the other films. there are two fights in the middle of the movie, between the opening fight and the climactic ending fight. On top of all that, there is death and vengeance all built in. this is a hell of a film, with lots going on at every moment. 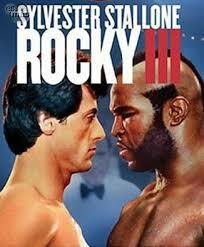 Rocky III is about as good as the first two films, but at the same time, it is also different. The first two rocky movies were very similar to each other. Rocky was a poor guy without much going for him in his life. He got a lucky break with a fight against the world heavyweight champion Apollo creed, and used it to change his life around. The first two movies both featured fights against creed as the big, climactic boxing match. This third movie does not. Instead, there is a new opponent, and that is Paulie Lang (played by Mr. T) the movie opens with clips of the last fight against Apollo, and it is a terrific fight, with both boxers falling at the same time, and only rocky being able to stand back up. In addition, like the second movie, where we continued off the first fight, went to the hospital for the aftermath, and saw a continuation of the scene that ended the movie, here we see that clubber Lang is in the audience. We see rocky continue with other fights, and clubber Lang is in the audience nearly every time, studying his opponent. We start noticing the differences between this rocky movie and the two that came before it, early on. Paulie is in bad shape, getting drunk at a bar and smashing an arcade game, and rocky comes to bail him out, dressed in nicer clothing than we have ever seen the boxer wear before. From there, we see rocky at home with Adriane and they are both looking spectacular. For one thing, the two of them are no longer in a dilapidated apartment, but are now in a nice big house with silk sheets and a huge bed. Things are definitely different now. Another major difference between this movie and the previous two is that this film features a big fight in the middle of the movie. The other films waited until the end to give us the only real fight (I suppose each Rocky film opens with a fight, including the first movie, but usually it’s just rewatching parts of the fight from the previous film.) here, in rocky III, we get a totally new fight in the middle of the movie as Rocky takes on Hulk Hogan. Once again, Clubber Lang is in the audience. Plays a character named thunderlips, and he goes on a rampage not just taking on Rocky, but also anyone else in his reach both in and around the ring. It’ a very strange match. Especially considering the whole thing is for charity and the way thunderlips acts after the match is all over. Away from the boxing match, other things are happening in rocky’s life. He gets a statue in his honor, put up by the city of Philadelphia on the steps where he would run and train. Rocky also plans to retire. He has taken on a number of opponents at this point and is undefeated. In the last movie, he planned to retire too, because of his bad eye. this time, instead of being influenced by Adriane (like in that last movie), it is Mickey, the manager, who is persuading rocky that it might be time to give it up. That is because Mickey thinks clubber Lang is too big of a monster. He says all of the other opponents were easy targets, but Lang is the real deal, and it might be too much for rocky to handle. Rocky accepts Lang’s challenge anyway, and fights him. It is still the middle of the movie, and that is another way that this film is different that the other rocky movies which came before it. He fights the opponent twice in the same movie. Once now, in the middle, and then once again at the end. In this middle fight, rocky loses, and then things only get worse. Right before the fight began Lang pushed Mickey, and Mickey had a heart attack. He’s still alive, but in really bad shape, lying on a bed in the dressing room with Adriane staying by his side as rocky fights. When the fight is over, rocky goes to see Mickey and say his goodbyes. Rocky lost badly to Lang, and now it is time to train for a rematch. This brings in Apollo, who is retired from boxing, but wants to help train rocky. Apollo brings rocky out to his old gym where there are only black men in the place training like crazy. That is where Apollo introduces rocky to the man who was Apollo’s manager for all those years. Together, they start training him, teaching rocky new routines such as swimming and running. Even with all this new training, however, things do not suddenly pickup for rocky. This is not the second movie where we can get fantastic training scenes and then move right into the fight. Instead, in this film, rocky is kind of falling apart, both mentally and emotionally. He loses to Apollo in ever race they have and Adriane pulls him aside on the beach one day to help find the underlying cause of what is going on with him. Rocky admits to her that he is afraid, and Adriane helps convince him that he can do it. From here, we do move to the final fight, and even this one is different from the fights in the other movies. This fight is all about getting to the point. There is no wasting time, and that means things like no shots of girls walking around with cards that say what round it is. 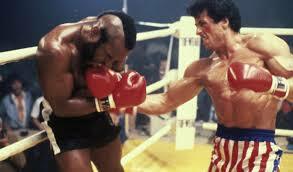 Instead, it is full throttle, rocky against clubber, the guy who killed his manager. This is a vengeance fight and it has the entire same feel as a great western. With both Apollo and Apollo’s manager in rocky’s corner, things are looking up. Rocky has even given Paulie a job on his team, getting the guy out of the dumps where he started the movie, with his breaking of the arcade game. Rocky III is very different from the other movies that came before it, and that is a good thing. While the first two movies were similar, this third one realizes it is time to change things up before ideas start feeling old. Therefore, it does. The movie is twenty minutes shorter than the others are, and yet it feels like there is more happening on the screen than in either one of those other films. That is because there are four different fights in this movie. Two of them take place in the middle of the film. There is also newer, faster music. This is the first Rocky movie of the eighties, and you can feel it with songs like “eye of the tiger.” there’s also a whole new take on rocky’s training sequences, having Apollo partner up with him to train and learn completely different routines. This movie finds many ways to make it feel fresh and unique, and they all work towards making it another great entry in the series.